Over the past few years, almost annually, the severity of Delhi’s Air Pollution comes to the forefront during peak winter. This year, despite the ban on sale of firecrackers in Delhi NCR, air quality has tangibly deteriorated to hazardous levels. This isn’t an isolated problem for Delhi. According to the World Health Organisation report, 4 of the 10 most polluted cities are based in India. The problem of Air Pollution is complex and arises out of several contributing factors and gets aggravated by seasonal and agricultural cycles. A unidimensional approach will not suffice. India needs to address this problem on an urgent basis through legislative action, technological innovation, community intervention as well as, economic incentives. Youngsters are more susceptible to the grave consequences of pollution affecting their lungs, hearts and brains. A recent Centre for Science and Environment (CSE) report stated that air pollution results in 30% of premature deaths in India, while every third child has impaired lungs. Not only does toxic air reduce the cognitive development and concentration abilities in kids, but also affects their physical capacities. Applicants are requested to submit an abstract (800 – 1000 words) identifying the core problem they seek to address and the proposed solution in brief. The abstract must be specific and should succinctly convey the proposed solution to one or more root cause of the problem. On the basis of the abstract, applicants will be shortlisted for final submissions. Selected candidates will have to submit detailed proposals containing implementable solutions with a cost-benefit analysis of the proposed solution, supported with evidence in support thereof. 1. How and by when should I submit my abstract? The abstract should be submitted latest by 11:59 PM, 28th January 2018. 2. What should be the format of the document? All papers should be submitted as PDF with proper citation and hyperlink wherever possible. 3. I didn’t receive any confirmation e-mail, is there any way I can check if my essay has been received? 4. Can I focus on more than one cause of air pollution? Yes, you can. The policy solution that you propose should be consolidated and should address both of these issues. 5. What criteria will be the paper be judged on? We are looking for solutions that address this problem on an urgent basis through legislative action, technological innovation, community intervention as well as economic incentives. The papers will be judged on the basis of strength of the arguments made, flow of the written piece and feasibility of the solutions implemented. 6. What is the word limit for the abstract? Will I be disqualified if I fall short of or exceed the word limit? The word limit for the abstract is 1000 words. For the abstract, the teams are required to stick to the aforementioned word limit. 7. What is the word limit and the research format that the final paper should be in? 8. What is the deadline for submitting the paper? 9. Will my paper be published anywhere? 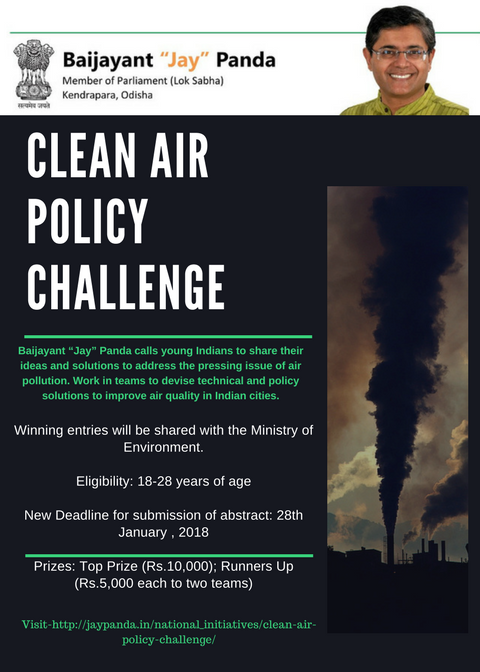 The best papers, with policy interventions that are innovative, most feasible and cost effective will be collated and sent to the “Ministry of Environment, Forest and Climate Change.” The decision of the judges will be final. 10. Are there any monetary prizes for the winners? If yes, please list out the various categories? We have prizes worth Rs 10,000 for the best submission and 5,000 each for the other 2 winners (2nd & 3rd best submission). The decision of the judges will be final.